The Space Fellowship recently spoke with N-Prize team “Team Prometheus” about their upcoming tests. The team have had recent successes noticeably a high altitude balloon flight which resulted in spectacular images and valuable information. Roger Harkness described the upcoming test “By launching prototype hardware to high altitude we can acquire realistic test data on the performance of that hardware. This includes operation of the hardware under extremes of temperature variation, and near vacuum conditions. The test will also exercise telemetry, tracking and ground station equipment“. The team have informed the Space Fellowship that Stewart Lilley designed a gore pattern and a vacuum system that makes zero pressure balloons very easy to construct. This process will later feature on the team website allowing other interested parties to construct their own. Roger Harkness further describes “Stewart and I have also devised a new tracking system using an optical telescope and star tracking software to guide The large dish. We will be experimenting in an attempt to achieve greater throughput and a more stable connection“. Roger later added “The test will also involve prototype satellite hardware that fits within the weight constraints of the N-Prize, and contains a functional radiolocation beacon“. Asked about what the team hoped to learn from the upcoming test, Roger Harkness outlines some of the key areas “About the prototype satellite, performance of the hardware under varying environmental conditions, performance metrics on the radio power and ground station equipment required for a reliable telemetry and tracking link. Data collected on this test will Contribute to improving the performance and reliability of future revisions of the satellite hardware“. Roger also outlined some of the functions the test satellite will be able to carry out “Sustain a continuous radio location, tracking and identification telemetry beacon for approximately 30 hours duration. By successfully tracking this beacon over distance, we can prove that we can accomplish the orbital determination requirements of the N-Prize“. Monroe Lee King Jr provided the Space Fellowship with an update on the Ground Station. 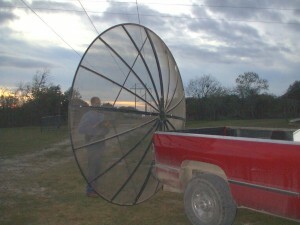 “We have assembled the 3 Meter dish and are working on slaving the GOTO telescope with the dish. Our tracking system employs the combination of optical tracking by reverse video and using star tracking software to track the balloon platform and keeping the dish pointed at the transmitter“. be a very good chance for some very exciting things to happen“. 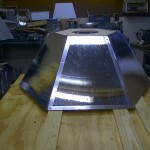 “We are building the Lunar Lander prototype for GLXP team frednet and developing systems for that moon landing attempt“. Monroe discusses how the teams came to be working together “Well I wanted Team Prometheus to compete in the X-Prize but came to the realization that we won’t have time for that and the N-Prize so I figured I better do something about that“. Some may question the logistics of trying to actively compete in two separate aerospace competitions, Monroe explains “It will have an effect that’s for sure, hopefully we can strike a note that will be in harmony with enough of the N-Prize attempt that we can keep the team happy“. Monroe also emphasises that the team are well on schedule to meet their N-Prize aspirations, adding “You bet! and you should keep up with our progress on Facebook, Tweeter or our Live webcam on Livestream. Or our yahoo group teamprometheusnprize“. Space Fellowship members can chat with Team Prometheus in their forum. The Space Fellowship thanks the team for taking the time to help with this article. Team Prometheus is an organization of individuals promoting the exploration of space for the purpose of finding economical means of utilizing this environment to the benefit of all mankind. We believe there are economical means to provide access to low earth orbit for interested organizations and company’s that can benefit from the use of smaller satellites. This will open a new era for the future and provide new avenues for increased revenues and scientific advancements. The N-Prize offers two cash Prizes, each of £9,999.99 (nine thousand, nine hundred and ninety-nine pounds and ninety-nine pence, sterling). One prize (the “single-spend-to-orbit”, or “SSO” Prize) will be awarded to the first entrant to complete the challenge using a non-reusable launch system. The other prize (the “reusable vehicle” or “RV” Prize) will be awarded to the first entrant to complete the challenge using a partially or wholly reusable launch system. Both prizes carry equal status. Copyright 2010 The International Space Fellowship. All rights reserved. This material may not be published, broadcast, rewritten, or redistributed without permission.